Speckle tracking echocardiography (STE) allows for the study of myocardial strain (ε), a marker of early and subclinical ventricular systolic dysfunction. Cardiac disease may be present in patients with acromegaly; however, STE has never been used to evaluate these patients. To evaluate left ventricular (LV) global longitudinal strain in patients with active acromegaly with normal LV systolic function. Patients with active acromegaly with no detectable heart disease and a control group were matched for age, gender, arterial hypertension and diabetes mellitus underwent STE. Global LV longitudinal ε (GLS), left ventricular mass index (LVMi), left ventricular ejection fraction (LVEF) and relative wall thickness (RWT) were obtained via two-dimensional (2D) echocardiography using STE. 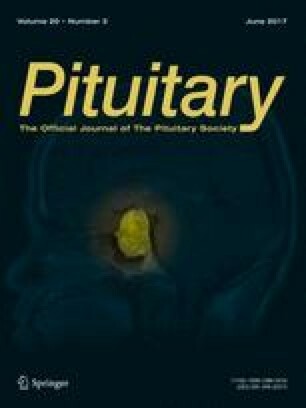 Thirty-seven patients with active acromegaly (mean age 45.6 ± 13.8; 48.6% were males) and 48 controls were included. The mean GLS was not significantly different between the acromegaly group and the control group (in %, −20.1 ± 3.1 vs. −19.4 ± 2.2, p = 0.256). Mean LVMi was increased in the acromegaly group (in g/m2, 101.6 ± 27.1 vs. 73.2 ± 18.6, p < 0.01). There was a negative correlation between LVMi and GLS (r = −0.39, p = 0.01). Acromegaly patients, despite presenting with a higher LVMi when analyzed by 2D echocardiography, did not present with impairment in the strain when compared to a control group; this finding indicates a low chance of evolution to systolic dysfunction and agrees with recent studies that show a lower frequency of cardiac disease in these patients. The research has not received funding from any organization or company and was sponsored by the authors themselves. MRG has received unrestricted research grants and lecture fees from Novartis, Ipsen and Pfizer, has participated on advisory boards of Novartis and Ionis, and is a principal investigator in clinical trials by Novartis and Ipsen. The other authors have no conflicts of interest. All procedures performed were in accordance with the ethical standards of the HUCFF/UFRJ ethical committee and with the 1964 Helsinki declaration and its later amendments. Informed consent was obtained from all individual participants included in the study.